Ultrasound (US) provides real-time, two-/three-dimensional safe imaging. Due to these capabilities, it is considered a safe alternative to intra-operative fluoroscopy in various computer-assisted orthopedic surgery (CAOS) procedures. However, interpretation of the collected bone US data is difficult due to high levels of noise, various imaging artifacts, and bone surfaces response appearing several millimeters (mm) in thickness. 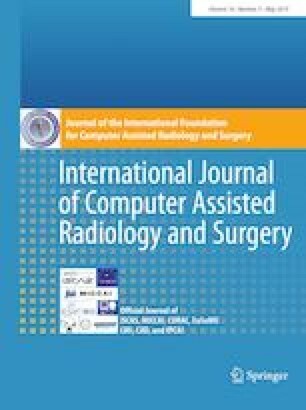 For US-guided CAOS procedures, it is an essential objective to have a segmentation mechanism, that is both robust and computationally inexpensive. In this paper, we present our development of a convolutional neural network-based technique for segmentation of bone surfaces from in vivo US scans. The novelty of our proposed design is that it utilizes fusion of feature maps and employs multi-modal images to abate sensitivity to variations caused by imaging artifacts and low intensity bone boundaries. B-mode US images, and their corresponding local phase filtered images are used as multi-modal inputs for the proposed fusion network. Different fusion architectures are investigated for fusing the B-mode US image and the local phase features. The proposed methods was quantitatively and qualitatively evaluated on 546 in vivo scans by scanning 14 healthy subjects. We achieved an average F-score above 95% with an average bone surface localization error of 0.2 mm. The reported results are statistically significant compared to state-of-the-art. Reported accurate and robust segmentation results make the proposed method promising in CAOS applications. Further extensive validations are required in order to fully understand the clinical utility of the proposed method. This work was supported in part by 2017 North American Spine Society Young Investigator Award.